Fall is also a great time to be a mom, since I'm finding so many fun things to do with the boys right now. We've done the apple orchards and pumpkin patches--with the farm rides and corn mazes, fresh apple cider and apple cider doughnuts. 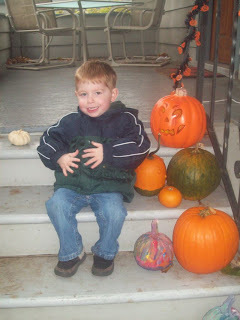 And this past week, Kira and I got pumpkins and had the boys paint them. You can see one of the painted pumpkins beside John's foot in this picture. The boys had a lot of fun with it, but honestly, so did I. I love that the boys are finally both old enough to do all of the activities I dreamed of doing before I became a mom. Easter egg hunts, painting/carving pumpkins at Halloween, making gingerbread men at Christmas, all of it is finally possible, for the most part. I say for the most part because of the mixed success we had with another Halloween project I cooked up. I had some tomato stakes that were just lying around, and it occurred to me that they were the shape of ghosts. A (very ill-defined) plan for making some ghosts with the boys started forming in my head. I was going to buy some cotton or cheesecloth at the craft store, but then I found a huge roll of polyester quilt batting that I wasn't likely to ever use in the basement, and grabbed the boys, their non-toxic washable paints, went outside, and tried to wing it. So we went outside, wrapped the batting around the stakes, and I drew a rough outline of a mouth and eyes on each ghost so that Sam could paint the face. 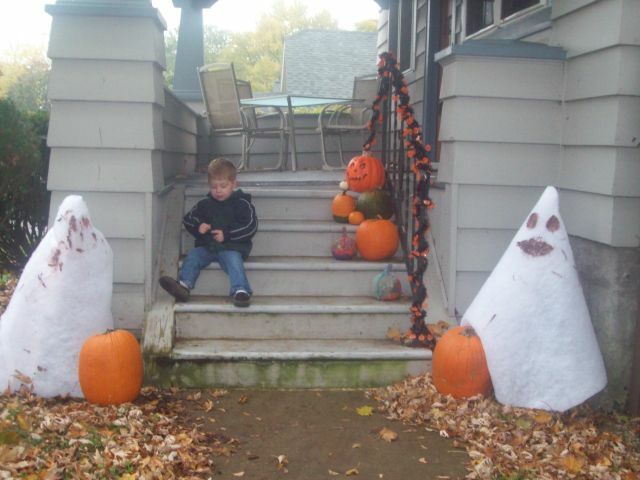 Except Sam thought the ghosts should have noses. And John, who didn't understand the spirit of the project, thought the ghosts needed some random paint dabs everywhere. This ghost turned out fairly well in spite of everything. But the boys had fun with it, they expressed themselves (Lefty The Ghost has three noses and two circular arms on his head), the boys feel a sense of accomplishment about the experience, and really, that's all that matters, right? In the future, I might try to make different tomato stake ghosts like the ones described here. But that'll have to wait until the fun of painting crazy ghosts wears off. And who knows? 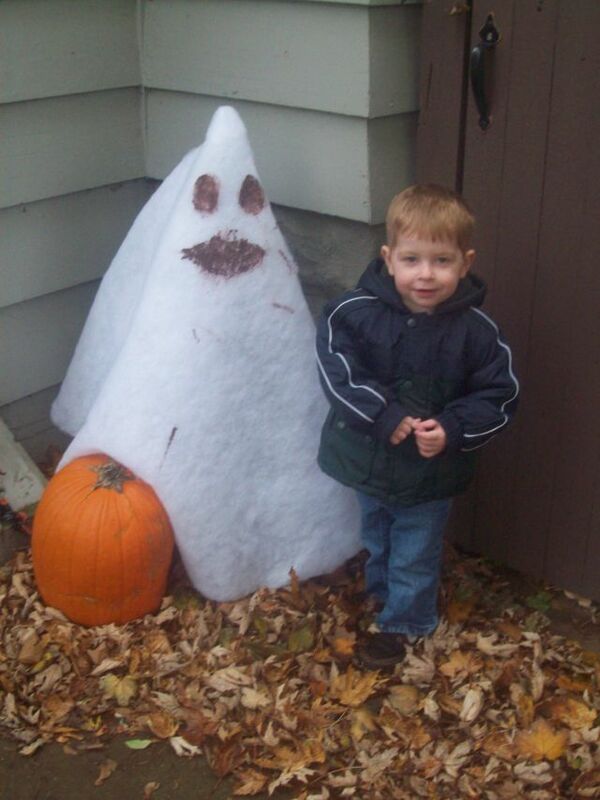 With our twisted sense of humor around here--the Halloween Paint-Your-Own-Crazy-Ghost thing could become an annual tradition. i like the paint your own crazy ghosts!